I don’t often do jewelry tutorials as it truly isn’t my passion. But let’s be honest … Independence Day is a great day to wear your red, white, blue, & stars! So, let’s just put them all together for a little bit of fun, shall we?! Condition 1/4 of each clay color separately. Divide each clay sheet in half. Roll each half of the clay through different thickness levels (one sheet on #3 and the other on #5). Do this for each color. You should now have a total of 2 sheet per color, each at a different thickness. Cut each sheet to the same size. HINT: Use a square cookie cutter to make it easy on yourself. Stack the sheets as follows: red, white, blue, white, red, white, blue, white. Gently press the top of your stack so all the squares stick to each other. Use a brayer to gently roll over the top of the stack to get all the air out. Now cut the stack in half. Stack them on top of each other in the same color order. Congratulations, you just made a striped cane! Now was that so hard … really? After you have trimmed the stack of all the wonky ends, you are ready to make your earrings. Cut a slice off your cane. Run it through the pasta machine on a medium setting, going the same direction as the stripes (place stripes up & down, not side to side). Choose another color for the center of your earrings, I used some of the red pearl I had leftover. Run your extra color through the third largest setting on your pasta machine. Place your striped sheet on top of the other sheet. Again, going the same direction as the stripes, run your clay through the 3rd largest setting of your pasta machine. You are making sure that there is no air trapped between these sheets & bonding them permanently, they can no longer be separated. Now use a star shaped cutter to cut out 4 star shapes. Use your earrings posts and place them on the back of the stars with a drop of Bake & Bond. Using your needle tool, poke a hole exactly in the center of the other stars. Slide the stars with the holes directly over the earring posts, this will force the posts toward the center. Press down with your fingers to secure. Use your fingers to smoother the seams. BAKING DIRECTIONS: Bake in your polymer clay oven at 275 degrees for no less than 45 minutes, tented with foil. Seal your pieces with Varathane and rebake for 10 minutes at 200 degrees once dry to seal the pieces. Don’t Throw Out Your Scraps! Don’t underestimate what you can do with your scrap clay. 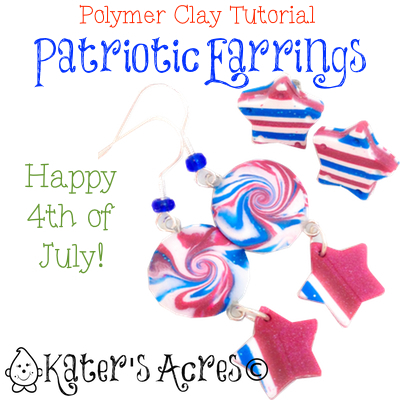 While it may seem like red and blue and white make a nice purple color, which they do … they also make nice beads to go with your earrings. 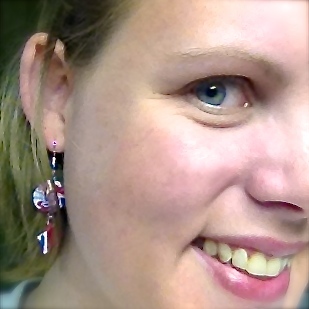 Using just the scraps from the pair of earrings above, I made both of these projects: lentil bead dangle earrings & a “Will” my new Patriotic Dragon necklace. Now my biggest problem will be deciding which pair to wear on my hot, hot date with my handsome hubby!